Give a man a chance to show his ambition, and his ambition can work wonders. After all, film-making is all about ambition. You've gotta have ambition sitting on your shoulder right throughout the process, otherwise there's no point in sharing your story. These days ambition runs a little thin. And one genre that is seriously lacking ambition is the monster movie. These things are easy to do - just create a monster, and let people fight it. Attack the Block is a fairly simple monster movie, but the thing that sets it apart from all of the others is its relentless ambition. Joe Cornish wasn't given the biggest budget for his movie, which only drives up the ambition even more. With that ambition comes a truck load of energy, which is unlike anything I've seen recently. Set against the backdrop of London council flats, Attack the Block begins with nurse Sam (Jodie Whittaker), on her way home from work, getting mugged by a bunch of locals. While they're mugging her, a meteorite interrupts them. Sam escapes, and the leader of her gang of muggers, Moses (John Boyega), goes to investigate the wreckage. There he finds a strange, alien-like creature, which he kills, and then takes it up to resident drug dealer Ron (Nick Frost) so he can take care of it while he figures out what to do. In that time, a whole pile of gorilla-like aliens descend upon their block of flats. Suddenly, it is the gang against these aliens as they fight to keep their block. Despite the fact that these guys mugged her earlier that night, Sam joins forces with them in order to keep their block intact, as these aliens try to take hold. Given the extremely short running time of 83 minutes, Attack the Block wastes no time getting straight into the story, and once it gets going, it doesn't stop. It has such vibrant energy running through it that it is impossible not to get swept up by it. There's a pulsating soundtrack from Basement Jaxx giving it an extra push (in the same way that The Chemical Brother's music did for Hanna), with some British hip-hop adding some more hipness. The entire thing plays out like it is on a livewire - just about the complete opposite to the dwindling post-Red-Bull crash that I experienced with The Amazing Spider-Man - giving us plenty of colourful characters to look out for, plenty of things to keep your eyes busy. Such unrelenting energy is a rarity, but Attack the Block is able to take you in from the first few minutes, which is no mean feat. Taking place mostly inside an apartment block, Attack the Block could draw comparisons to The Raid. And they would make for an interesting, if a little exhausting, double feature. 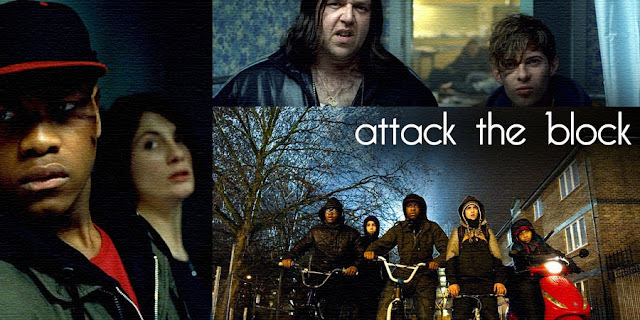 Both of them have the same, simple energy, even though Attack the Block is a little more excited about it all. The relatively small budget isn't that much of a problem, either. The design of the monsters is simple. They're gorilla looking things with neon mouths. And they're as effectively terrifying as anything I've ever seen. That's probably because they aren't the same old CGI messes that are covered in snot. They look like you could cuddle them, but those neon things serve as a warning as to why you shouldn't. Which is a great shame. You could sell those things to kids, and then they'd make their way into homes before taking over the world. Maybe I'm looking a bit too much into it but hey, if Attack the Block wanted me to put the scares up, that's how I did it. If these guys did end up taking over the world, maybe we'd be okay in the hands of Moses and his gang. They start out as the people we are supposed to hate because of their treatment of poor Sam, but they come to the party as heroes. What partially troubled me was that they were cut out of the same bread as the group of teens in another post-apocalyptic British film Shank. The Attack the Block kids are a little easier to side with, but they still have the same thin character development as those annoying people in Shank. At least Attack the Block has energy running through it, instead of anger. Even though it has been over a year since Attack the Block first surfaced and everyone went pretty crazy over it, I've managed to keep relatively blind about this film. So I definitely didn't expect to be so inspired by Joe Cornish's efforts. But when ambition and energy runs as thick as it does here, it's hard not to be uplifted by what is essentially just a simple monster movie. Seen it twice now. I got my wife loving it, and I'll eventually get all of my friends to love it. It's awesome! My friends and I came *this* close to getting it out, but we ended up not getting it. In the future though, it will be my duty to get everyone to love it. It was definitely one of my favorites last year, no doubt about it. Just the simple story of it all. I also thought that the overall writing was brilliant, the way the story unfolded. Some characters could have used more and some less of the actual character writing but not everything can be perfect. Not everything can be perfect, but it doesn't matter with this film. I could easily overlook the flaws when I was having that much fun. Ambitious and fun! Such a funny script! It's an amazing film with a brilliant script, much better than it gets credit for. It's a film that only gets better with repeat viewings. And I gotta disagree on the thin character development, at least in regards to Moses and potentially Sam. Some of the other boys, yeah, not so much. But those main two have pretty relevant shifts. I can't wait to see it again and again and again. It was awesome. There were just so many characters that I couldn't keep a handle on all of them. Moses and Sam were really well developed, though. I particularly like how Sam wasn't used purely as a victim and Moses became a hero. It's a awesome film. Great cast and a lot of fun. Man, I had a lot of fun with this film. I was extremely into it. 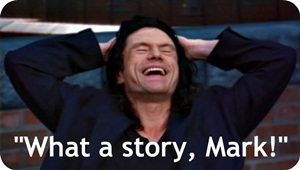 This is what a film should be. It so is! I wish more films could be like this. I have a feeling this is one my whole family would enjoy. :-) Great review!